3. I used Lion Brand Pound of Love. 4. Actual measurements 22 inch circumference and 18 inch length. 5. For scale my baby is about 20 inches with a 14 inch head. Rounds 10-31: Repeat rounds 8 and 9. I have looked everywhere for a pattern for something like this. 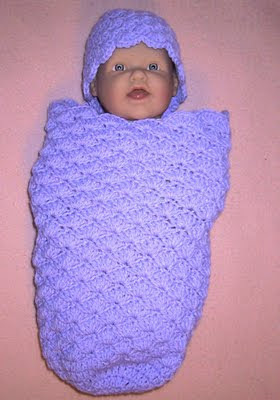 I will be making one for a friend who is expecting and one for my daughter who is also expecting. Thank you for a great pattern. OH! I am so excited to find out you designed this pattern!!! I can't wait to make them for my charity! Such a pretty stitch! Thank You so much!!! This is great. I think I'll make two as sleeping bags for my daughter's 18 inch dolls... she's always looking for new accessories for them and I've found that many baby patterns are the perfect size for them. Thanks! This looks like a wonderful pattern to make. I'm sure I will enjoy making it. Now...off to find some yarn in my stash! Great pattern! My supervisor is expecting and this will make a GREAT gift. Thank you for sharing. Ditto, Ditto, Ditto, thanks for the pattern.. Thank you for sharing the pattern. Frustrating to see it on search, and many times it is another search. I do appreciate it. I'm posting a link to this (and your picture, credited) over at crochet every day. I love it! The post will be up tomorrow! Thanks Suz! HELLO, JUST LOVE THIS SHELL SLEEP SACK AND CAP. THANKS SO MUCH, I HAVE BEEN LOOKING FOR SOMETHING LIKE THIS. HELLO AGAIN, JUST A NOTE TO TELL YOU THAT I NOW FINISHED THE SHELL HAT AND I CANNOT THANK YOU ENOUGH FOR THESE INSTRUCTIONS. HELLO SUZIE, I WISH YOU LIVED CLOSE BY SO WE CAN CROCHET TOGETHER, YOUR PATTERNS ARE SO EASY AND BEAUTIFUL. Measurements are in the "notes". aww I wish I had seen this pattern before I started the other one...well, I guess I could make 2! I love the shell stitch so dainty and very attractive. Just finished the shell baby sack. while I consider myself a knitter, I do crochet on occasion. I found the pattern easy and well written. I made the set in a day and a half as time was an issue. I think the mother to be will be very pleased. Thanks for the pattern. I love all your patterns I use alot of them for gifts to people. Someone asked what hook I would use to make the sleep sack with size 3 yarn. I would use the Big Shell Sleep Sack pattern and a G hook. we have 6 ladies pregnant in our family. two babies have been born so far. i made this for one of them and it is very nice. one is our daughter who is pregnant and the others are our grandaughters. thanks for sharing the pattern. Having trouble getting the circumference to 22 inches. Yarn, hook and technique of the individual crocheter can make a difference in the results. If you want it larger than you are getting, use the "Big Shell" sleep sack instructions. Different people work at different yarn tension and that is probably what accounts for the difference in sizes. Is this what you are looking for? All the patterns are listed on the right hand side of the blog. End 8, I’m getting 18 shells. Is this correct? Pattern says 12 but I can not come up with 12. Yes 12 shells is correct. If you had 72 on round 6, it should come out to 12. Each repeat of instructions uses 6 sts, 72/6=12.